Having been active since the 1960s, the Nitty Gritty Dirt Band achieved its first number one single in 1984. Hot Country Songs is a chart that ranks the top-performing country music songs in the United States, published by Billboard magazine. In 1984, 50 different singles topped the chart, then published under the title Hot Country Singles, in 52 issues of the magazine, based on playlists submitted by country music radio stations and sales reports submitted by stores. Six acts tied for the most number ones in 1984, with three each: bands Alabama and Exile and soloists Earl Thomas Conley, Merle Haggard, Ricky Skaggs and George Strait. One of the two songs to spend more than a single week at number one was a collaboration between Willie Nelson and Julio Iglesias. Iglesias had been successful in his native Spain and other Latin markets since the late 1960s, but 1984's album 1100 Bel Air Place was his United States breakthrough. The first single from it, "To All the Girls I've Loved Before" in collaboration with Nelson, was a top 10 hit on the all-genres Billboard Hot 100 but went all the way to number one on the country chart. The only other multi-week chart-topper in 1984 was "Why Not Me" by mother-daughter duo The Judds, which ended the year at number one. The Nitty Gritty Dirt Band had its first number one in 1984. The band had been active since the 1960s and released a number of acclaimed albums in the 1970s before shortening its name to simply Dirt Band and taking a mainstream pop music approach. Soon after reverting to its original name and switching back to country music, the band finally achieved its first Hot Country chart-topper with "Long Hard Road (The Sharecropper's Dream)". Exile also topped the country chart for the first time in 1984; the band had topped the Hot 100 six years earlier for four weeks with the disco-influenced pop track "Kiss You All Over", but went on to achieve much greater success after a shift to the country genre in the early 1980s. Eddy Raven also reached number one for the first time in 1984 with "I Got Mexico", a decade after his first hit. He would go on to have a total of six number one singles. Although primarily associated with Latin music, Spanish singer Julio Iglesias had a country number one in 1984 with a duet with Willie Nelson. 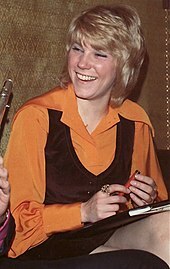 Canadian singer Anne Murray had two chart-toppers in 1984. Johnny Lee was another act to top the chart twice during the year. "I Can Tell By the Way You Dance (You're Gonna Love Me Tonight)"
"I Don't Want to Be a Memory"
"That's the Thing About Love"
"You're Getting to Me Again"
^ Deming, Mark. "Julio Iglesias Biography & History". AllMusic. Retrieved February 28, 2018. ^ Harrison, Thomas (2011). Music of the 1980s. ABC-CLIO. p. 113. ISBN 9780313366000. ^ Eder, Bruce. "The Nitty Gritty Dirt Band Biography & History". AllMusic. Retrieved February 27, 2018. ^ Huey, Steve. "Exile Biography & History". AllMusic. Retrieved February 27, 2018. ^ Roland, Tom. "Eddy Raven Biography & History". AllMusic. Retrieved February 28, 2018. ^ "Eddy Raven Chart History". Billboard. Retrieved March 1, 2018. ^ "Hot Country Songs chart for January 7, 1984". Billboard. Retrieved February 26, 2018. ^ "Hot Country Songs chart for January 14, 1984". Billboard. Retrieved February 26, 2018. ^ "Hot Country Songs chart for January 21, 1984". Billboard. Retrieved February 26, 2018. ^ "Hot Country Songs chart for January 28, 1984". Billboard. Retrieved February 26, 2018. ^ "Hot Country Songs chart for February 4, 1984". Billboard. Retrieved February 27, 2018. ^ "Hot Country Songs chart for February 11, 1984". Billboard. Retrieved February 27, 2018. ^ "Hot Country Songs chart for February 18, 1984". Billboard. Retrieved February 27, 2018. ^ "Hot Country Songs chart for February 25, 1984". Billboard. Retrieved February 27, 2018. ^ "Hot Country Songs chart for March 3, 1984". Billboard. Retrieved February 27, 2018. ^ "Hot Country Songs chart for March 10, 1984". Billboard. Retrieved February 27, 2018. ^ "Hot Country Songs chart for March 17, 1984". Billboard. Retrieved February 27, 2018. ^ "Hot Country Songs chart for March 24, 1984". Billboard. Retrieved February 27, 2018. ^ "Hot Country Songs chart for March 31, 1984". Billboard. Retrieved February 27, 2018. ^ "Hot Country Songs chart for April 7, 1984". Billboard. Retrieved February 27, 2018. ^ "Hot Country Songs chart for April 14, 1984". Billboard. Retrieved February 27, 2018. ^ "Hot Country Songs chart for April 21, 1984". Billboard. Retrieved February 27, 2018. ^ "Hot Country Songs chart for April 28, 1984". Billboard. Retrieved February 27, 2018. ^ "Hot Country Songs chart for May 5, 1984". Billboard. Retrieved February 27, 2018. ^ "Hot Country Songs chart for May 12, 1984". Billboard. Retrieved February 27, 2018. ^ "Hot Country Songs chart for May 19, 1984". Billboard. Retrieved February 27, 2018. ^ "Hot Country Songs chart for May 26, 1984". Billboard. Retrieved February 27, 2018. ^ "Hot Country Songs chart for June 2, 1984". Billboard. Retrieved February 27, 2018. ^ "Hot Country Songs chart for June 9, 1984". Billboard. Retrieved February 27, 2018. ^ "Hot Country Songs chart for June 16, 1984". Billboard. Retrieved February 27, 2018. ^ "Hot Country Songs chart for June 23, 1984". Billboard. Retrieved February 27, 2018. ^ "Hot Country Songs chart for June 30, 1984". Billboard. Retrieved February 27, 2018. ^ "Hot Country Songs chart for July 7, 1984". Billboard. Retrieved February 27, 2018. ^ "Hot Country Songs chart for July 14, 1984". Billboard. Retrieved February 27, 2018. ^ "Hot Country Songs chart for July 21, 1984". Billboard. Retrieved February 27, 2018. ^ "Hot Country Songs chart for July 28, 1984". Billboard. Retrieved February 27, 2018. ^ "Hot Country Songs chart for August 4, 1984". Billboard. Retrieved February 27, 2018. ^ "Hot Country Songs chart for August 11, 1984". Billboard. Retrieved February 27, 2018. ^ "Hot Country Songs chart for August 18, 1984". Billboard. Retrieved February 27, 2018. ^ "Hot Country Songs chart for August 25, 1984". Billboard. Retrieved February 27, 2018. ^ "Hot Country Songs chart for September 1, 1984". Billboard. Retrieved February 27, 2018. ^ "Hot Country Songs chart for September 8, 1984". Billboard. Retrieved February 27, 2018. ^ "Hot Country Songs chart for September 15, 1984". Billboard. Retrieved February 27, 2018. ^ "Hot Country Songs chart for September 22, 1984". Billboard. Retrieved February 27, 2018. ^ "Hot Country Songs chart for September 29, 1984". Billboard. Retrieved February 27, 2018. ^ "Hot Country Songs chart for October 6, 1984". Billboard. Retrieved February 27, 2018. ^ "Hot Country Songs chart for October 13, 1984". Billboard. Retrieved February 27, 2018. ^ "Hot Country Songs chart for October 20, 1984". Billboard. Retrieved February 27, 2018. ^ "Hot Country Songs chart for October 27, 1984". Billboard. Retrieved February 27, 2018. ^ "Hot Country Songs chart for November 3, 1984". Billboard. Retrieved February 27, 2018. ^ "Hot Country Songs chart for November 10, 1984". Billboard. Retrieved February 27, 2018. ^ "Hot Country Songs chart for November 17, 1984". Billboard. Retrieved February 27, 2018. ^ "Hot Country Songs chart for November 24, 1984". Billboard. Retrieved February 27, 2018. ^ "Hot Country Songs chart for December 1, 1984". Billboard. Retrieved February 27, 2018. ^ "Hot Country Songs chart for December 8, 1984". Billboard. Retrieved February 27, 2018. ^ "Hot Country Songs chart for December 15, 1984". Billboard. Retrieved February 27, 2018. ^ "Hot Country Songs chart for December 22, 1984". Billboard. Retrieved February 27, 2018. ^ "Hot Country Songs chart for December 29, 1984". Billboard. Retrieved February 26, 2018. This page was last edited on 13 January 2019, at 23:52 (UTC).